Native to Northern Africa, Asia, Europe, and the Indian Subcontinent. Introduced and naturalized in North America. Moist. Thickets, clearings, wood openings. This is a sprawling perennial vine that rises from rhizomes. It may be found trailing over adjacent shrubs and bushes. It often forms colonies. Young stems are purple and are hairless or sparsely covered with straight, stiff, upward-pointing hairs. Older stems are brown and woody. The leaves are alternate, triangular in outline, ¾″ to 3″ long, ⅔″ to 2″ wide, on long, slender leaf stalks. Some are unlobed, others are divided into a large terminal leaflet and two small basal leaflets or lobes. The margins are untoothed. The upper surface is hairless or sparsely covered with straight, stiff, upward-pointing hairs. The inflorescence is a 1″ to 3″ wide branched cluster of 6 to 12 flowers. 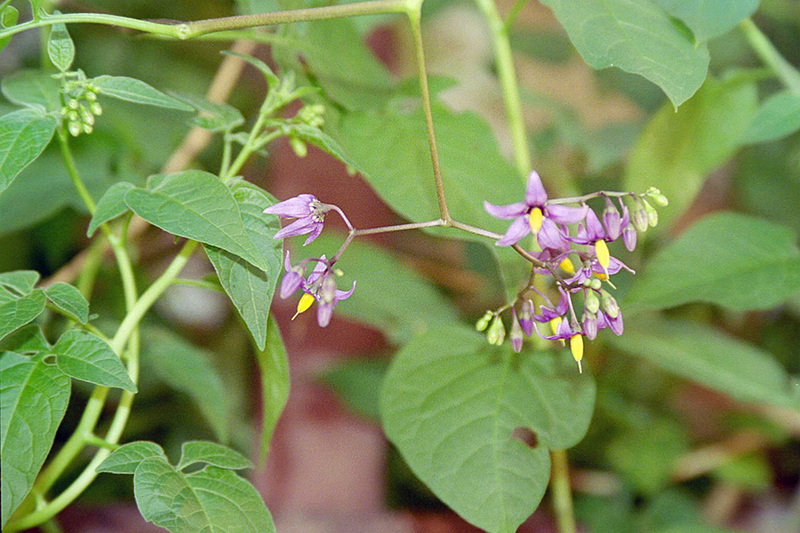 The clusters are at the end of purple or violet, ⅔″ to 1½″ long stalks arising from the	leaf axils and at the end of the stems. The individual flowers are on nodding, closely-clustered stalks. 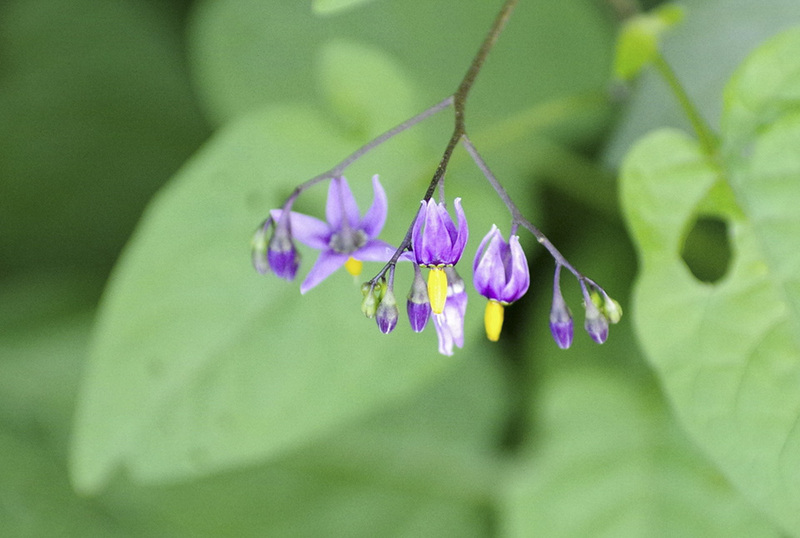 The flowers are ⅓″ to 1½″ wide. There are 5 purple or violet petals that are widely spreading, eventually curving backward, and form no tube at the base. There are 5 stamens with large yellow anthers projecting from the center of the petals. The anthers are fused into a cone around the style. The style is longer than, and protrudes from, the anther cone. 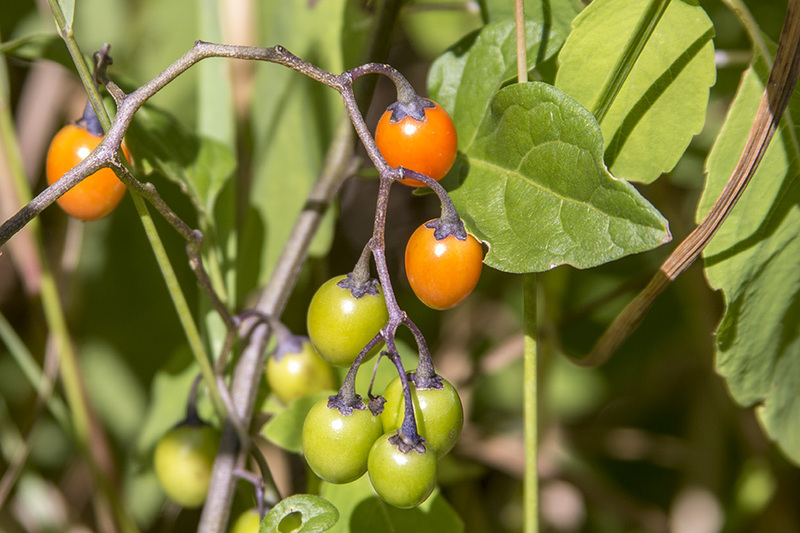 The fruit is an oval, ¼″ long berry, green when young, turning yellow, then orange, and finally bright red when ripe. Distribution Sources: 2, 3, 4, 5, 7, 8, 22, 24, 28. Bittersweet Nightshade at Whitetail Woods Park. All parts of the plants are toxic. 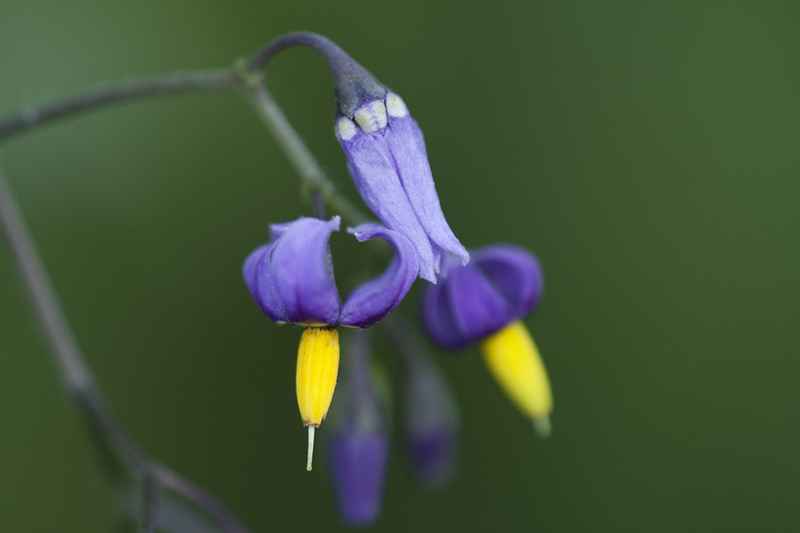 Bittersweet nightshade is a an invasive perennial plant native to Eurasia. © 2009 Virens. All rights reserved. 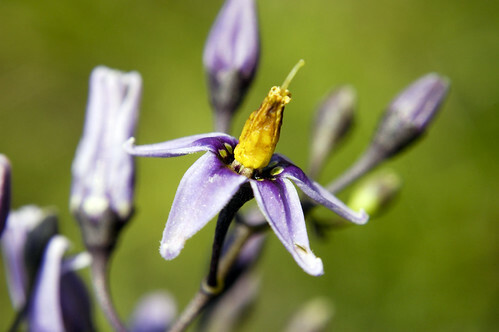 Woody nightshade is also known as bittersweet nightshade, dulcamara, felonwood, and felonwort. In the Middle Ages the name dulcamara was written more properly as Amaradulcis, and literally means "bittersweet". Felonwood and felonwort are not as sinister as they sound; felon is not referring to criminals, but rather to whitlow, which is inflammation of the toe or finger around the nail. The berries were used to sure this problem when other methods had failed. The plant was used for many medical conditions, including dissolving blood clots (in bruises), for rheumatism, fever, and as a restorative. Farmers used it as a charm around the necks of animals they thought to be under an evil eye. 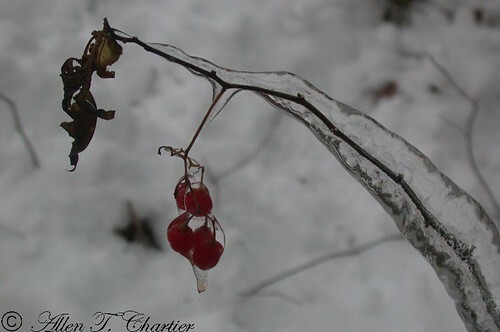 Bittersweet berries are red rather than black like deadly nightshade. The beautiful red berries are capable of causing death if you eat too many. But the name gives the clue to why so few people are killed by its poisons. 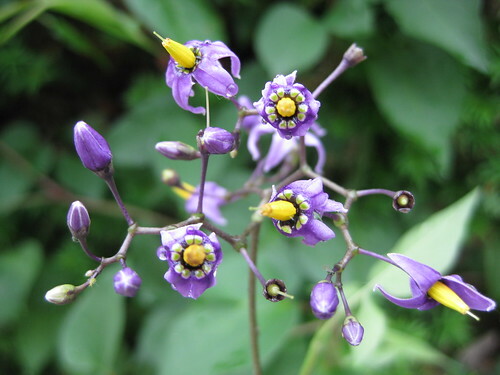 Solanum dulcamara, also known as bittersweet, bittersweet nightshade, bitter nightshade, blue bindweed, Amara Dulcis, climbing nightshade, fellenwort, felonwood, poisonberry, poisonflower, scarlet berry, snakeberry, trailing bittersweet, trailing nightshade, violet bloom, or woody nightshade, is a species of vine in the potato genus Solanum, family Solanaceae. 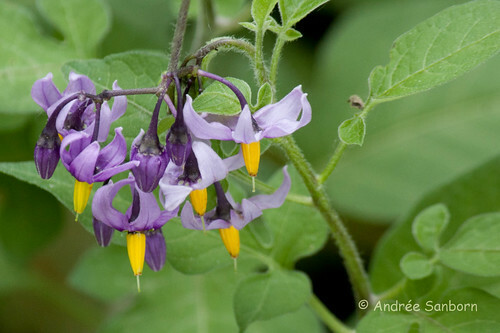 Bitterzoet (Solanum dulcamara) is een vrij algemeen voorkomende, vaste plant uit de nachtschadefamilie (Solanaceae). Volksnamen zijn dolbessen-hout, elf-rank, hoe-langer-hoe-liever, klimmende nachtschade en qualster. European Bittersweet is a Eurasian species that has established itself in North America. It is distantly related to both the potato and the tomato. 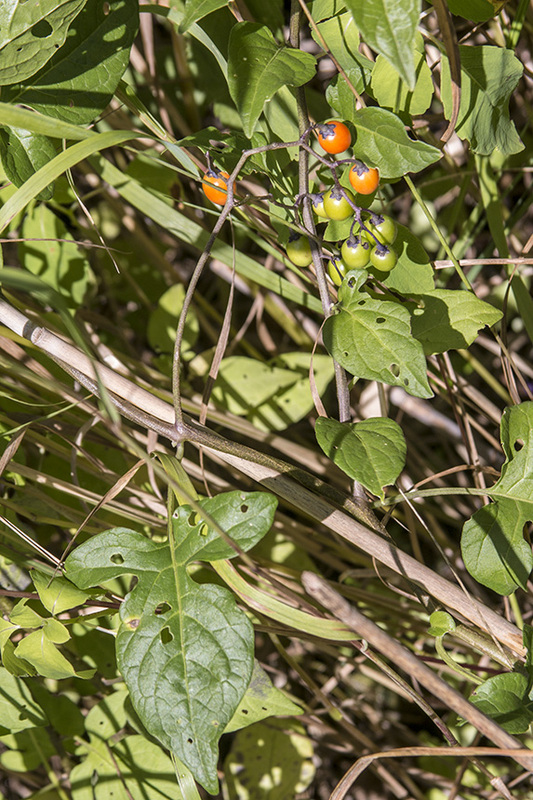 The berries and leaves are mildly poisonous and pose a hazard to livestock. 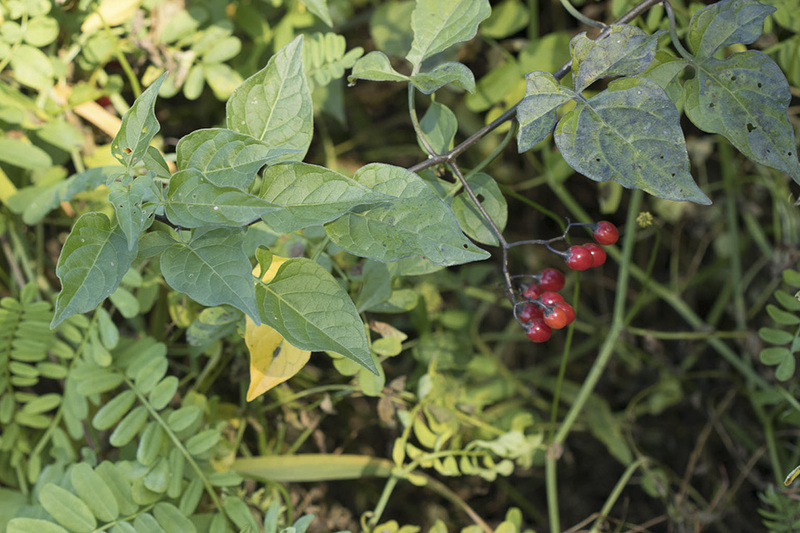 It is also related to the nightshades which can be very poisonous. Spotted the purple flowers among the large grapevine on my backyard chainlink fence. Read that the berries can be toxic to dogs, so I removed it. The vines were about 10 feet long, emanating from a woody stock of about 8 branches. this has been growing at my home since I purchased it in 2010, I didn't know what it was.